Adrian Lewis Peterson was born on the 21st March, 1985 in Palestine, Texas, USA. He is a professional American football player who plays in the position of running back. 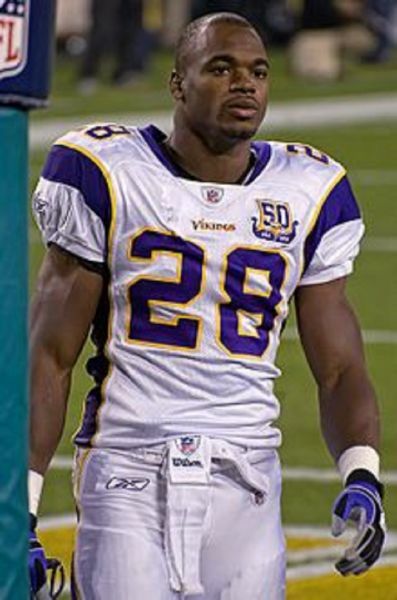 Adrian Peterson has been accumulating his net worth playing professionally in the team of the Minnesota Vikings since 2007. How rich is the sportsman? Reportedly, the net worth of Adrian Peterson is as much as $30 million. It has been estimated that he salary equals $14 million a year – plus endorsements. Peterson attended the University of Oklahoma, in which he played as a running back for the College Football Oklahoma Sooners. He was already been a candidate for the Heisman Trophy in his first year, which, however, went over to Matt Leinart. In 2005, he suffered his first severe injury, an ankle injury. Peterson had to sit out four games, but he scored 1,208 yards over games and 14 touchdowns in the Big 12 Conference. In 2006, he was injured again, this time a collarbone, and missed most of the season until the last game, the Fiesta Bowl, making 77 yards and a touchdown. In the 2008 season he was the best running back in the league with 1,760 yards and ten touchdowns and was elected FedEx Ground Player of the Year. Among many other achievements during his career, in the 2012 season, he scored his tenth touchdown of more than sixty yards, and finished the season with an average of 6.0 yards per run – only five other players have managed this average, being greats Beattie Feathers (in 1934 – 8.4), Joe Perry (in 1954 – 6.1), Jim Brown ( in 1963 – 6.4), O. J. Simpson (in 1973 – 6.0) and Barry Sanders ( in 1997 – 6.1). Then Peterson was elected the Most Valuable Player (MVP) and Offensive Player of the Year. In the 2013 season he suffered injuries which resulted in finishing the season with 1,266 yards and 10 touchdowns in 14 games. Due to an accusation of child abuse Peterson was suspended by NFL in the 2014 season and played only a few games. However, sport is still the most important source of his wealth. In seasons 2011-14, he was rated in the top 10 players in the NFL, and has already set records in rushing attempts, yards and touchdowns for the Minnesota Vikings, among many other achievements. Finally, in the personal life of the sportsman, Peterson is the father of two daughters and four sons, with several mothers. He has been married to Ashley Brown since 2014. The youngest of his two sons, a two-year boy, was established as the victim of deadly abuse that was allegedly inflicted on him by the spouse of the mother. Children Tyrese Robert Ruffin, Adeja Peterson, Adrian Peterson, Jr.
1 Nephew of Ivory Lee Brown.